Imagine a typically busy day at the Jersey shore. You and your family have immersed yourselves in sun, sand and water, and might be ready for a change of pace by mid-afternoon. Hopefully you will encounter a presenter from scienceonthebeach.com doing a free, on-the-beach, half-hour-long program of interactive physical science demonstrations. scienceonthebeach.com is designed to engage, entertain and inform by linking physical science concepts with the out-of-the-classroom, unique beach experience. scienceonthebeach.com provides young beachgoers and their families with an extra component and complement to their day of fun at the beach at Long Branch, NJ. Your feedback is valuable... please contact us with suggestions, corrections and comments. 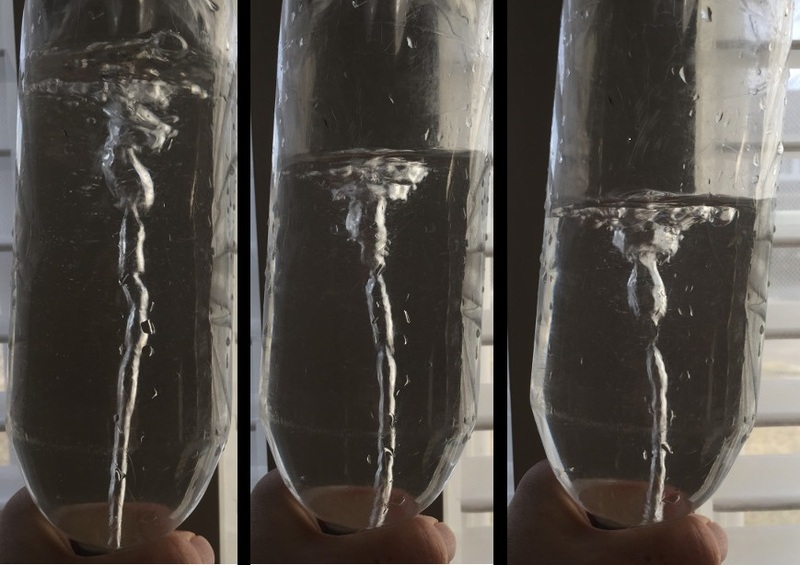 What makes the cartesian diver go up and down in the water bottle? What decides whether an object will sink or float in water? What makes the giant (60-foot-long) solar tube float upward in the air? Why does water seek to be at the same level (height above the ground) in the funnel and in the attached plastic tube? Why does a full water bottle inverted in a basin not spill out, though only the open neck of the bottle is submerged? So, the denser water settles down at the bottom of the glass with the lighter air above. Now, back to the vortex, if water in the upper bottle is trying to go down to the lower bottle, then to make room, it pushes the air in the lower bottle up to the upper bottle. The pushed-up air is visible in the bubbly vortex you see. When you try this demonstration, you discover a problem. Water tries so hard to get to the lower bottle that it blocks the hole between the bottles. You have to give the two-bottle apparatus a strong twirl to create a tiny air hole for the air to go up, in the middle of the water going down. That twirl creates a circular or spiral vortex which sustains and preserves the small air hole. Using the infrared thermometer, what is the temperature of the ocean water? The surface sand? The subsurface sand? Your cold drink temperature? The temperature of ice floating in your cold drink? the temperature of the air? The temperature of the giant solar tube floating upward in the air? What happens if you look through two polarizing filters and rotate one of the filters? Can you explain what is going on? What do you notice about the rock that was photographed both without and with one polarizing filter? Look at the ocean or clouds or objects on the beach through one polarizing filter, then rotate that filter to see what happens. IMPORTANT: NEVER look directly at the sun, with or without a filter. 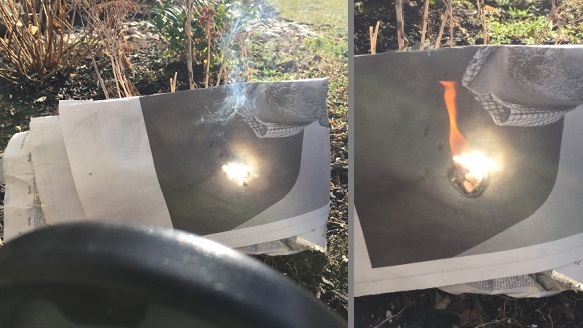 Extra question: ask your science teacher to show you what happens if you have a third polarizing filter at 45 degrees between two polarizing filters rotated from each other by 90 degrees. How does sunlight shining on a magnifying glass or a concave (closeup) mirror create a bright and hot spot of light? Does the spot of light more easily ignite the light-colored area or the dark ink-covered area of a piece of newpaper, and why? NOTE: This experiment should be done with ADULT supervision to prevent burns. Why do bubbles shoot out the top of the straw, while the water level in the bottle is so much below the bubbles and getting lower? And what exactly are the bubbles made of? Hint: Below the bottle shown there is another connected bottle, and both bottles contain water and air. So, the denser water settles at the bottom of the glass with the lighter air above. But what makes the water go to the bottom of the glass or down to the lower bottle? Hint: Why does everything seem to go down if it is not held up? Have you heard of gravity? Next think about whether air is something that can exert a force. Do you experience the force of air when it is windy? So if air can exert a force, might the air be pushing its way up and out of the straw, dragging some water along to make bubbles? Go back one step: What is pushing the air? Might the water trying to get to the lower bottle push the air out of the way? Think about the beach again. Might the force of air (perhaps from wind or moving water) along with the force of gravity that makes water waves crash down on the beach so the water "bounces" off the sand, explain how some ocean water splashes up very high at the beach, much higher than the actual waves? The pinwheel above is sitting absolutely still. What could make it spin? Okay, from other explanations on this page, we know that moving air can make things (like bubbles) move. So, two things have to happen to make the pinwheel have a spinning motion. Do you see wind air catchers on the pinwheel? Will they fly away if the air pushes, or are they attached so they cannot fly away? So then, if the pinwheel is pushed, what can it do? Why, spin of course! How can the spinning pinwheel be used to make energy to, say, light a light bulb? Well, the force of the spinning pinwheel can be connected to push electrons to make electricity. On a really big scale, this is how air and water turbines operate to power our homes. How does filling a vertical cardboard tube with sand keep the wind, or someone, or maybe a wave, from tipping it over? How can this be used as a construction technique for buildings near the coast? Besides creating a strong pillar, what else about the cardboard tube makes it difficult for moving air (wind) or moving water to get a hold of the tube and push it down? Hint: Does air or water have fingers like you to grab on to things? Where will the moving air or water go when it reaches the cardboard tube but cannot grab on to push it? What keeps the sand pendulum funnel swinging back and forth? What goes through the funnel more easily, small sand particles or large particles? Wet or dry sand? Does the mass of sand in the funnel (proportional to weight) affect the rate of swing? Does length of the string connecting the funnel to the frame affect the rate of swing? What are frequency or period? (frequency = swings per second, period = time for one swing) Can the funnel swing in a circle? Which plastic sand-sifter-sorters would let medium-sized particles through? Which would let the smallest pieces through? Which would catch only the largest pieces? Why does the piece of coral not fall out? Why does the yellow bowl not turn upside down? How is it that magnetism makes iron filings move when we move the magnet? Does the magnet attract anything on the beach? 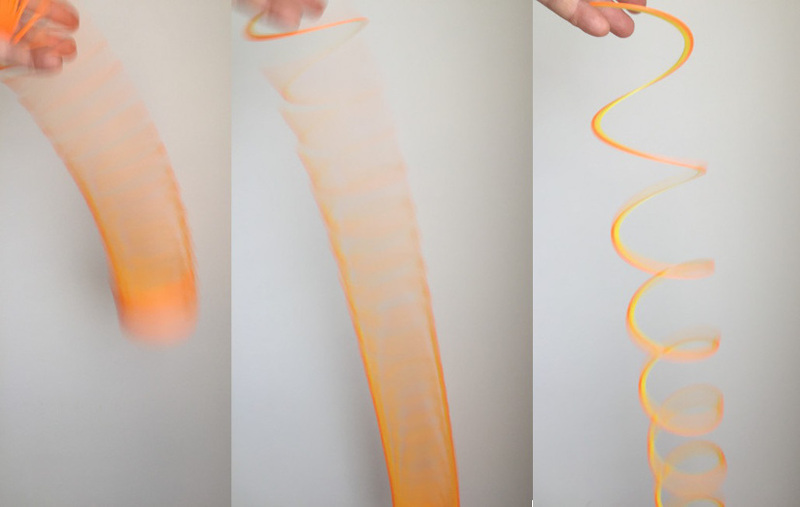 Why does the Slinky move like it does? What is forcing the Slinky to move? How many different ways can you create a wave in the Slinky? And what makes waves in the ocean? How can sound traveling through air and light traveling through space carry information for communicating with perhaps difficult-to-reach places? You know that the water waves that reach the beach carry lots of energy from out in the ocean, since these waves can push us over!! There are also waves in the air which we know as sound, and waves or rays in air and space that we know as light. The sound and light waves may not be strong enough to push us over, but they are strong enough to jiggle the diaphragm in our ears and the retina in our eyes so that we hear and see. Imagine two friends playing on one of the large pirate ship play structures on the Long Branch NJ beach. The two friends can have a communications problem if one person is up at the ship's wheel, and the other is in the nearly windowless and dark space at the bottom of the ship. What if we put tubes or pipes connecting the two locations? One tube carries sound waves for speaking and listening. A second tube designed as a rotating periscope carries light rays so that the person at the bottom of the ship can get a 360-degree view of whatever is happening at the ship's wheel on the upper deck. Hopefully Long Branch will install speaking tubes and periscopes in each of the large pirate ship play structures on the Long Branch Beach. If you encounter them, try them out to experience sound waves and light waves, just like the ocean waves! How might scienceonthebeach.com add an educational and fun geocaching activity to the interactive map at longbranchbeach.com linked below? Click here for longbranchbeach.com (your smartphone is best) then click the menu icon at upper left, then "map, driving and parking" then "interactive map". You will encounter a feature-rich GPS-based geolocation experience that is useful to get to and navigate around the beaches at Long Branch, NJ. What does the video show? 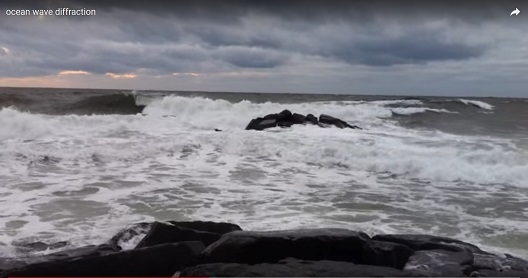 Click to see waves bending around that further-out rock jetty... Why do the waves bend? So first, what actually moves across the ocean is wave energy -- each particle of ocean water actually does not move very far. As the wave energy comes into the beach, part of the energy rubs against the rock. What happens then? Might that wave energy slow down? If you imagine the peak of a wide wave as the heads of a wide row of people next to each other and moving toward you, then what happens if the people on one end of the row need to slow down? The other fast end swings ahead while the people closer to the slow end slow down a little or a lot, depending how close they are to whatever makes the slow end have to slow down. So the whole row seems to bend or rotate. Ask your teacher to try this with your class, with everyone lining up in a row -- it works! Hundreds of volunteers planted beach grass on rebuilt dunes along more than a mile of Long Branch NJ beach during fall and spring planting events in 2016 and 2017. The rebuilt dunes are next to the new sea wall and new boardwalk that were needed after superstorm Sandy destroyed the old boardwalk and damaged dunes and vegetation on October 28, 2012. How does the beach grass help hold the sand in place and prevent erosion of the sand? Erosion is the moving of the sand by wind, rain and seawater, which is undesirable in this situation. An overview of each of the scienceonthebeach.com demonstrations is available on this website by clicking the menu icon. The description of each demonstration is expected to provide an overview of the particular activity, suggest essential questions, and will ultimately include pictures and diagrams. Guiding the interactive demonstrations that make up scienceonthebeach.com presentations are federal and state science and technology education standards for K-12, as well as contemporary teaching and learning strategies. You are encouraged to browse these descriptions, whether you are previewing the descriptions before you and your family participate in the live demonstrations, or whether you are reflecting on the experience afterwards. Please, anytime you are visiting the beach at Long Branch NJ this summer, look for scienceonthebeach.com interactive science demonstrations. Thank you! Please communicate with us! Thanks for visiting the Long Branch NJ beach. scienceonthebeach.com presents a free, on-the-beach, half-hour-long program of interactive demonstrations designed to engage, entertain and inform by linking physical science concepts with the out-of-the-classroom, unique beach experience of being immersed in sun, sand and water. Beginning in August 2009, scienceonthebeach.com has put its interactive demonstrations on the Long Branch NJ beach numerous times each beach season. The half-hour-long program takes place primarily on weekends with additional midweek presentations during busy beach weeks and also when Long Branch summer enrichment camp is scheduled for the beach. At the suggestion of the Long Branch Recreation Department, locations for the program are chosen to be on the periphery or outside of Pier Village, at any place on the Long Branch beach frequented by families with younger children who are the most likely audience for the program. A few minutes of setting up scienceonthebeach.com demonstrations usually attracts some attention. After setting up, the presenter then walks around the immediate area, pointing out to parents with children where science demonstrations will begin in a few minutes. A group of from five to twenty mostly 2nd to 8th grade young people then gathers, along with their observing parents who usually accompany their kids. Often one or two older children are very engaged in the demonstrations from the start, and then actively encourage siblings and other younger children to participate so that everyone has the experience of trying each of the demonstrations. As the half hour of formal activity ends, a few participants invariably ask to continue experimenting with the gear, and/or have questions they want to ask or comments to share such as about their classroom science education experiences. Assessing this project, the scienceonthebeach.com presentation seems to be a consistently popular addition to their day for the informally-gathered audiences of elementary up to middle school children and their parents. The interactive demonstration kit is portable and quick to set up and break down. The initial enthusiastic involvement of some (usually older) participants is contagious and spreads to most if not all attending, even the youngest, as each person is encouraged to take a turn with each interactive demonstration. There is effective sharing of the full range of everyone's knowledge and abilities to the best of their age-limited capabilities. Participant collaboration contributes significantly to facilitating the success of the program. scienceonthebeach.com is grateful to have been green-lighted by the Long Branch NJ Recreation Department, Carl F. Jennings, Director of Recreation and Human Services, under the umbrella of their many activities in Long Branch supporting youth. scienceonthebeach.com is additionally grateful for encouragement from Long Branch Schools Board of Education and administration, City Council and Mayor, and Monmouth University. Click here for the link to Educational Innovations, Inc. which is the source of most materials for scienceonthebeach.com demonstrations. Educational Innovations was created by teachers for teachers (though anyone can order on the web from their incredible and cost-effective catalog of science gear). Thanks to Educational Innovations! An ongoing goal of scienceonthebeach.com is to work with the Long Branch Recreation Department to recruit, train and support part-time creators/innovators/designers and teachers/demonstrators from among the Long Branch beach staff (mostly Long Branch HS students and summer-returning college students) as well as any others interested in sharing science knowledge and experience with the wider community. Participating in networks and partnerships with local and regional science museums and other education institutions and organizations is an ongoing goal for scienceonthebeach.com. Another goal is fundraising outreach to the private sector to cover expense of materials, pay student demonstrators, and initiate new projects. The website scienceonthebeach.com will continually evolve as a resource for the program. The expectation is that like the interactive hands-on beach presentations and possible future exhibit installations, the website will reflect current education best practices along with universal family and community values. scienceonthebeach.com seeks to effectively complement and enhance the out-of-the-classroom, unique, and intrinsically educational beach experience of being immersed in sun, sand and water. As a possible extension of the live demonstrations, scienceonthebeach.com is pursuing semi-permanent science-education-oriented and science-art-oriented installations modeled after those found outdoors at science museums, that could be strategically placed on the beach, possibly along the promenade or at sand level near beach entrances. Exhibits could utilize space around handicap ramps or adjacent to boardwalk pillars. Exhibits would be designed to be self-directed, so that when young, old and inbetween beachgoers encounter an exhibit they can easily add a few minutes of impromptu science-oriented learning fun to their beach-going experience. If the City were to approve this approach, museum and other institutional partnerships and private funding would be sought for design, construction and installation of the semi-permanent science and/or art installations. A current proposal from scienceonthebeach.com is for a dual-focus installation involving both light and sound, to be installed within one or more of the six large pirate ship play structures that are placed along the beach during the summer. Two PVC vertical pipes would be installed, extending from the interior lowest level of the pirate ship to the upper deck near the ship's wheel. One PVC pipe is a sound tube for communication such as was found on ships before electronics, so that someone on the upper deck can easily talk with someone at the lower level. The second pipe is a rotating periscope so that someone in the nearly windowless and dark lower level can get a 360-degree view that originates from the upper deck. The planned rebuilding of the next generation of the historic oceanfront pier in Long Branch NJ has been promised to include education and play components. Hopefully the experiences of scienceonthebeach.com will be useful in planning educational aspects of the Long Branch oceanfront pier. The Vector Excel Computer Lab is presented as a final activity for the topic of vectors in a first high school physics course. Teaching vectors helps pre-assess and prepare students for so many topics in physics that involve reconciling one, two and sometimes three dimensions of actions and motion. (1) You might introduce and reinforce particular vector KSAs by interspersing Physics Classroom tutorials and worksheets with your teaching. These are linked below, specifically addressing vector magnitude and direction, components, resolving, resultants, order of addition does not matter, and printable worksheets ("think sheets"). (2) As their first way to find the resultant of superimposed vectors, students might draw using ruler and protractor (graph paper is not necessary), applying the head-to-tail method. Students work to get magnitudes and directions of all vectors correct in the head-to-tail configuration, and then are able to plot and measure the resultant. (3) After students demonstrate reasonable mastery of drawing using the head-to-tail method, they can find the resultant by resolving vectors into orthogonal components using a simple application of (and perhaps their first experience with) trigonometric functions. (4) Finally, during one double-period lab, students move to a computer lab setup. Students are given the handout for the Vector Excel Computer Lab. As students follow the lab instructions to interact with Excel, they are exposed to the power of technology to assist in solving the problem of determining the resultant of multiple vectors. 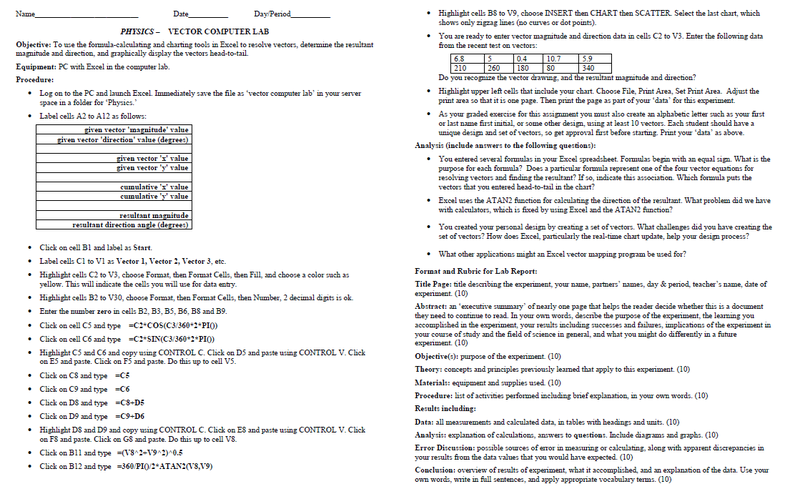 CLICK HERE to open the Vector Excel Computer Lab worksheet PDF, or right-click and "save link as" to download the PDF. Teachers can conveniently cut and paste from the PDF to a blank Excel spreadsheet to try it out. But you may want students to use their computer keyboards to manually type each cell entry into Excel referencing their paper copy of this lab worksheet. do calculations on a large scale that otherwise manually would be very tedious. quickly work through an iterative scientific method / engineering design process to get their desired outcome. Cross-cutting (1) -- Applying technology to create a coded version of the head-to-tail drawing method and the resolving vectors method, both of which students had used previously to combine vectors and determine the resultant. Cross-cutting (2) -- The scientific method / engineering design process is utilized by students as they see the result of their work immediately visualized in the Excel chart, and thus can iteratively refine and perfect their work in a "trial > error > adjust > repeat" process. Cross-cutting takes place as a student initially debugs the spreadsheet. Then additional cross-cutting occurs when the student uses the debugged spreadsheet as a tool to solve a different (creative) problem: creating and continually refining a drawing of the initial letter of the student's name using vectors. Cross-cutting (3) -- Another instance of cross-cutting in this Vector Excel Computer Lab is the coincidental introduction of students to SVG (scalable vector graphics) which is an advanced industrial graphics technique using vectors to draw lines, shapes, text letters, etc. SVG is the underlying technology of PDFs, and also interoperates with webpage design. Snapshot of result of the Vector Excel Computer Lab. Note that the data shown here gives a small resultant magnitude that might be difficult to determine when manually drawing the vectors. Combine both gravity and horizontal linear acceleration to give a resultant acceleration. Apply this to other kinematic questions to move into the kinematics topic. Discuss Global Positioning System (GPS), geolocation, navigation, mapping. Click below on longbranchbeach.com for links that launch various GPS apps. Write an Excel program to model the GPS geolocation calculations in a smartphone that reconcile paths from multiple GPS satellites which are continually transmitting time-stamped signals. Also consider the secondary smartphone geolocation strategy that uses signals from in-range wireless routers, where the router location has been identified and stored in a cloud database. Write an Excel program to model and calculate the resultant of superposition of multiple waves, e.g. ocean waves combining to create an unusually high-amplitude rogue wave. Click here for longbranchbeach.com then click the menu icon, then "beach map, driving and parking" for a map that includes live GPS-based geolocation. A red balloon marker on the map indicates your position relative to all the features shown on the map. There are also buttons on the map to select and launch your smartphone's personal GPS application, with Long Branch beach automatically preloaded as the destination, and your current location as the origin, so that your GPS app will guide you to Long Branch beach. FYI, clicking any icon, label or photo on the Long Branch beach map will set that location's precise GPS coordinates as the exact GPS destination. We know that a radar gun or ultrasound might be used to measure the speed of an object. Alternatively, on the longbranchbeach.com map, click "Show Info" and scroll down to the table to see geolocation data used to derive the smartphone speed and direction (just as a GPS app does).